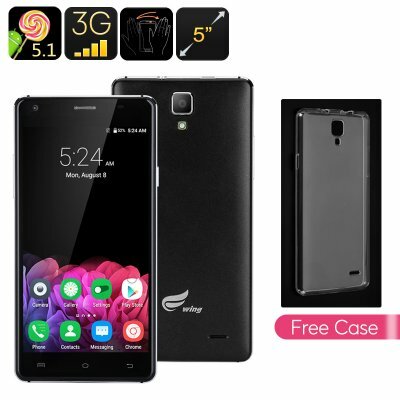 Successfully Added Ewing E8 Android Smartphone - 5 Inch Screen, 720P, Quad Core CPU, Mali GPU, Smart Wake, Android 5.1 (Black) to your Shopping Cart. If you're looking for a quality budget Smartphone offers a great user experience then the E8 from Ewing is a worthy contender. A stylish metal frame, 2.5D arc class and lush look belie the phones affordable price tag. With iuts 5 inch HD screen you won't be disappointed with the visuals as there are bright rich colors and pixels a plenty to bring you a fantastic viewing experience making it suitable for games and movies alike. Packing in a quad core 1.3GHz MediaTek CPU this and with 1GB or RAM this phone has plenty of grunt for the daily Smartphone takes and equipped with the efficient Android 5.1 operating system its more than capable of keeping pace with your multitasking demands. Offering 2 SIM card slots, that can each be active at the same time ensures you have a wide area of supported usage. This also brings the ability to use two numbers on the one devices, great for keeping work and personal contacts organized. Smart wake shortcut commands are accusable on the phone so you can navigate directly to the music player, contacts or internet browser from the locked screen with. Packing in a 2200m,Ah battery lets you enjoy up to 8 hours of continuous usage which should be enough to see you through the most hectic of days. With front and rear cameras you can snap off selfies as well as great scenic shots or even take 720P video - all of which can be saved on a micro SD card as the phone allows for up to 32GB of removable storage. The Ewing E8 Smartphone comes with a 12 months warranty, brought to you by the leader in electronic devices as well as wholesale Chinese smartphones..